Displaying records 1 to 20 of 575 total results. 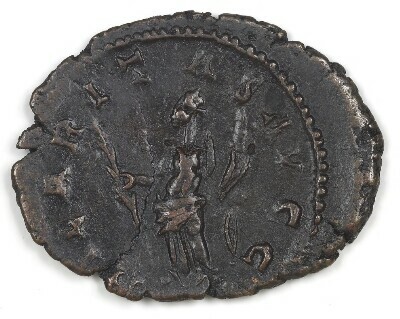 Coin of Ptolemy IV Philopator, Alexandria, 221 B.C.-201 B.C. 1890. 221 B.C. 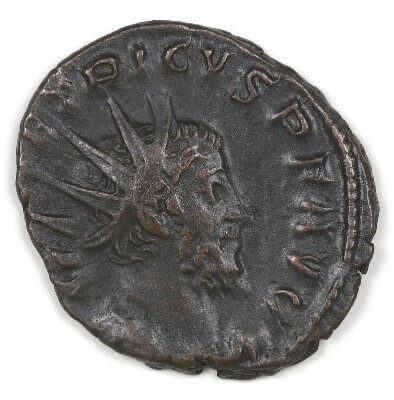 - 201 B.C. 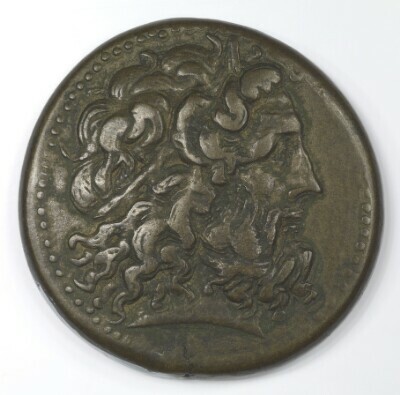 Zeus-Ammon-Hercules facing right, border of dots. 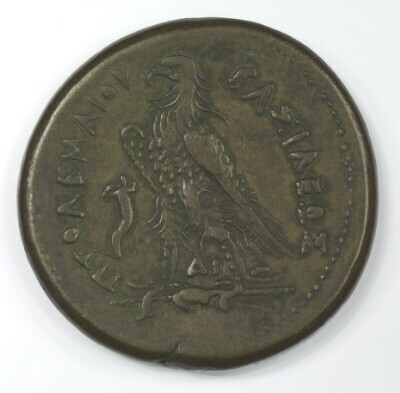 ΠΤΟΛΕΜΑΙΟΥ ΒΑΣΙΛΕΩΣ (PTOLEMAIOU BASILEOS): Eagle with folding wings standing in thunderbolts facing left. ΔΙ between feet. Cornucopiae in field left. 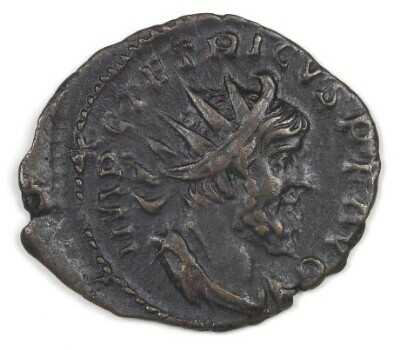 Antoninianus of Victorinus, 269-270. 1987.46.10. 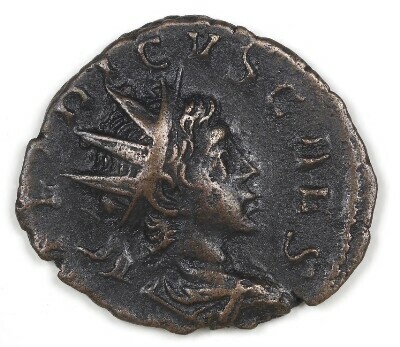 IMP(ERATOR) C(AESAR) VICTORINVS P(IVS)F(ELIX) AVG(VSTVS): Radiate head, right, cuirassed. 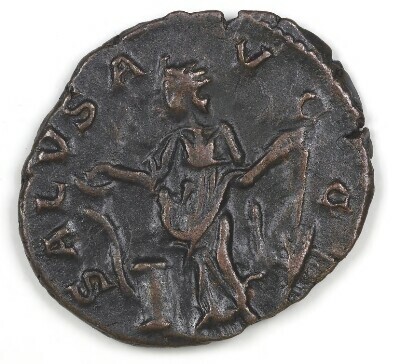 SALVS AVG(VSTI): Salus standing right feeding serpent in arms from patera held in left hand. 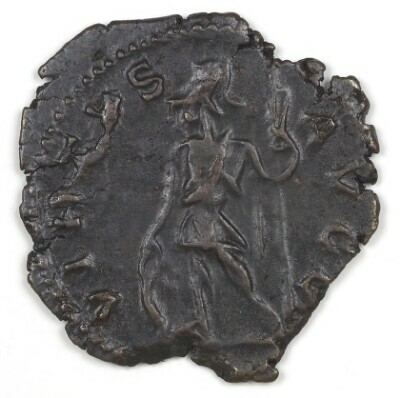 Antoninianus of Victorinus, 268-270. 1987.46.11. 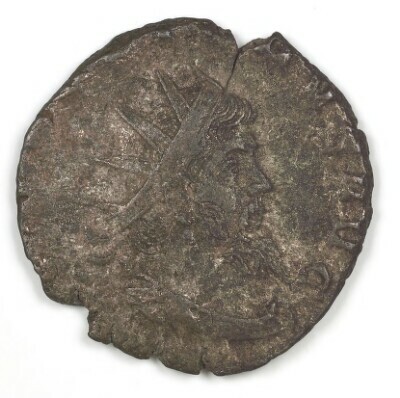 Antoninianus of Victorinus, 269-270. 1987.46.12. 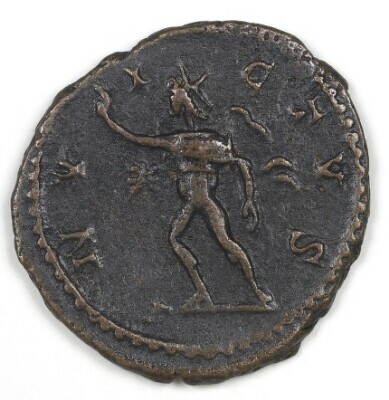 IMP(ERATOR) C(AESAR) VICTORINVS P(IVS)F(ELIX) AVG(VSTVS): Radiate head, right, cuirassed, draped. 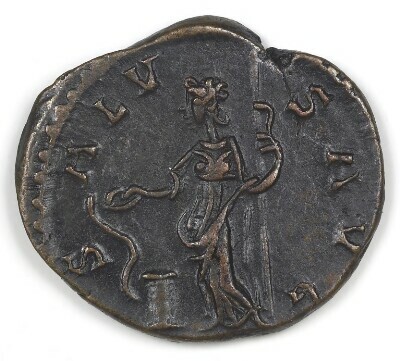 SALVS AVG(VSTI): Salus standing left feeding serpent rising from altar from patera held in right hand, holds verticle sceptre in left hand. 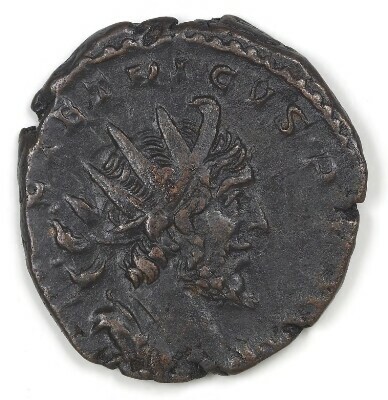 Antoninianus of Victorinus, Colonia Claudia Ara Agrippinensium, 269-270. 1987.46.13. INVINCTVS: Sol running left, right hand raised, left hand holding whip. 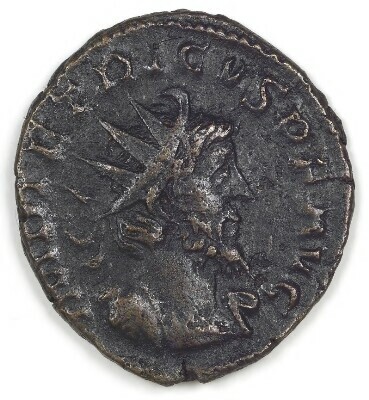 Antoninianus of Victorinus, Colonia Claudia Ara Agrippinensium, 268-270. 1987.46.14. 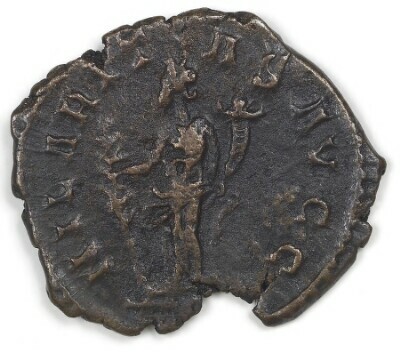 Antoninianus of Victorinus, 269-270. 1987.46.15. 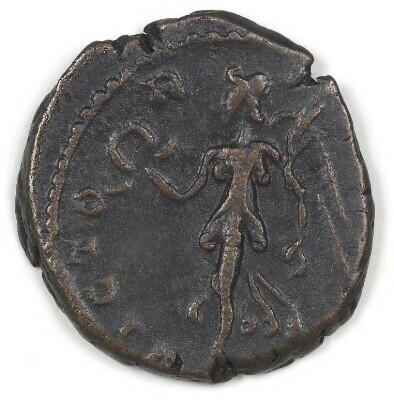 VIRTVS AVG(VSTI): Soldier standing right, holding sceptre in right hand, left arm leaning on a shield. 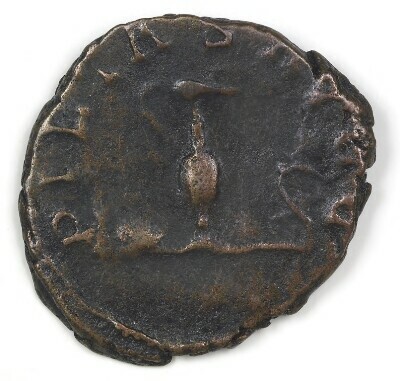 Antoninianus of Tetricus I, Mint I, 270-273. 1987.46.16. 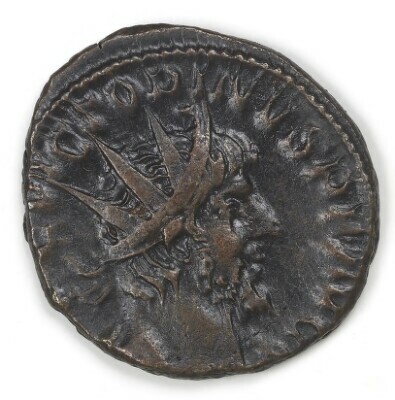 IMP(ERATOR) C(AIVS) TETRICVS P(IVS)F(ELIX) AVG(VSTVS): Radiate head, right; draped. 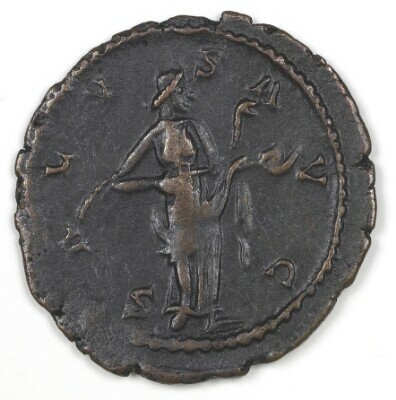 COMES AVG(VSTI): Victory standing left, holding wreath in right hand and palm branch in left. 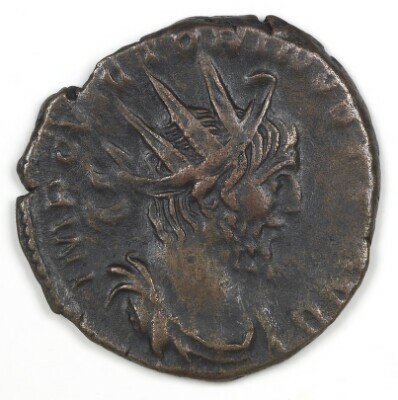 Antoninianus of Tetricus I, 270-273. 1987.46.17. IMP(ERATOR) C(AIVS) TETRICVS AVG(VSTVS): Radiate head, right; draped, cuirassed. FIDES MILITVM: Fides standing left, holding two ensigns. 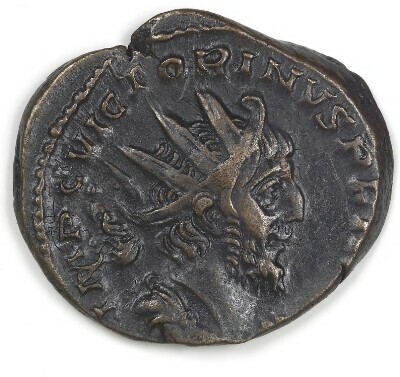 Antoninianus of Tetricus I, 270-273. 1987.46.18. IMP(ERATOR) C(AIVS) TETRICVS P(IVS)F(ELIX) AVG(VSTVS): Radiate head, right; cuirassed. 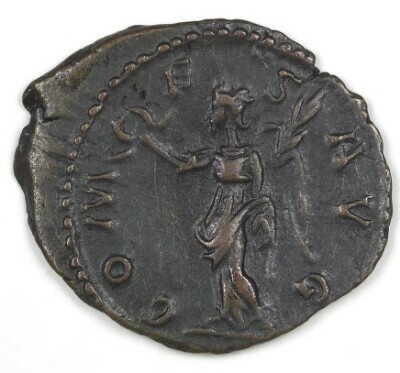 HILARITAS AVGG(VSTI): Hilaritas standing left, holding palm in right hand and cornucopiae in left. 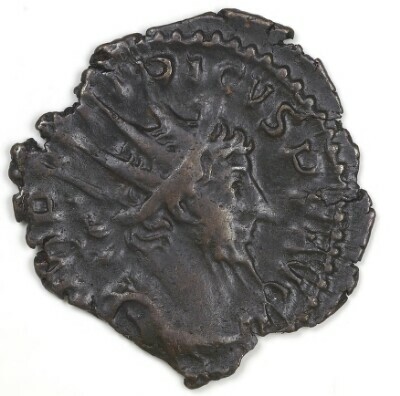 Antoninianus of Tetricus I, 270-273. 1987.46.19. 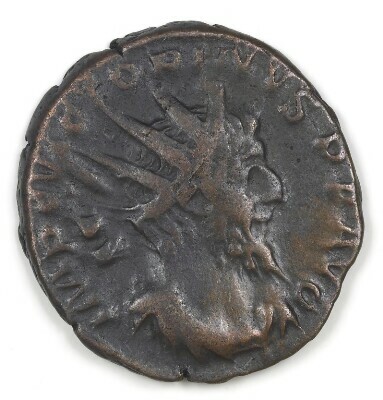 Antoninianus of Postumus, Mediolanum, A. D. 268. 1987.46.2. 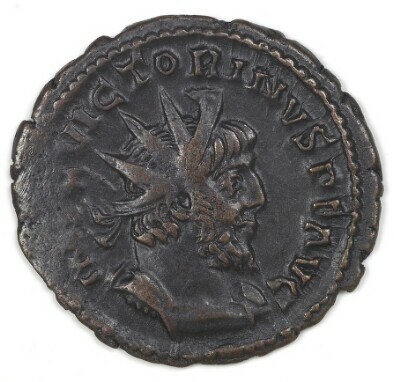 IMP(ERATOR) POSTVMVS AVG(VSTVS): Radiate head, right; draped. 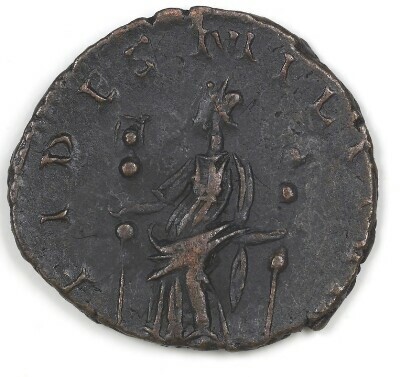 FIDES EQVIT(VM): Fides seated left, holding patera in right hand and ensign in left. 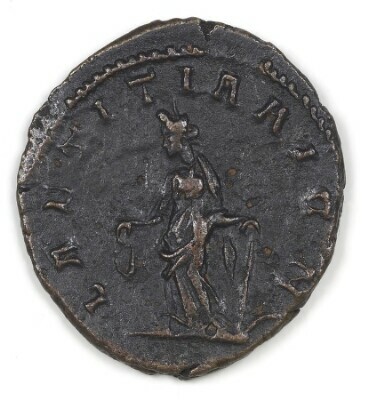 Antoninianus of Tetricus I, 270-273. 1987.46.20. LAETITIA AVGG(VSTI): Laetitia standing left, holding wreath in right hand and anchor in left. 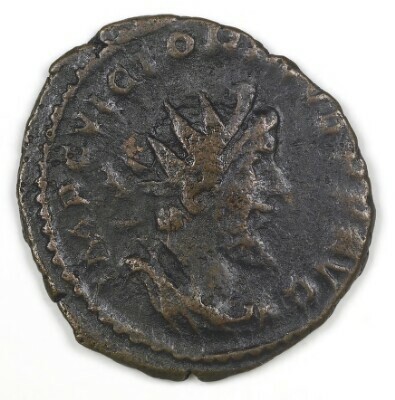 Antoninianus of Tetricus I, 270-273. 1987.46.21. IMP(ERATOR) C(AIVS) TETRICVS P(IVS)F(ELIX) AVG(VSTVS): Radiate head, right; draped, cuirassed. 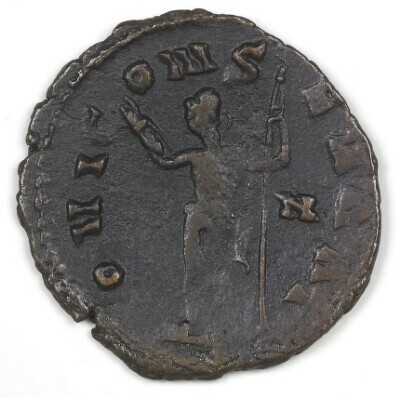 PAX AVG(VSTI): Pax standing left, holding olive branch in right hand and a sceptre in left. 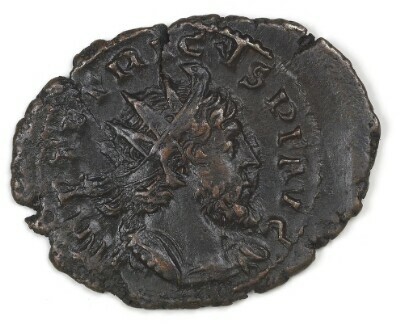 Antoninianus of Tetricus I, 270-273. 1987.46.22. 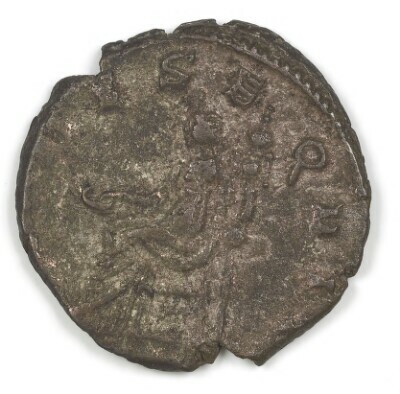 SALVS AVGG(VSTI): Salus standing left, feeding serpent rising from altar out of patera in right hand, holding anchor in left. 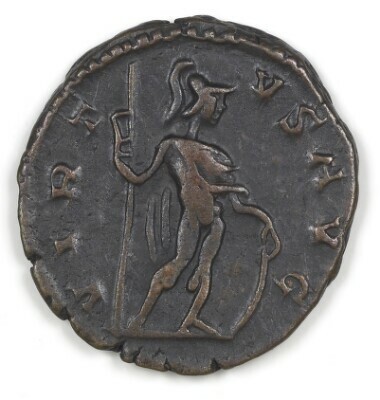 Antoninianus of Tetricus I, 270-273. 1987.46.23. 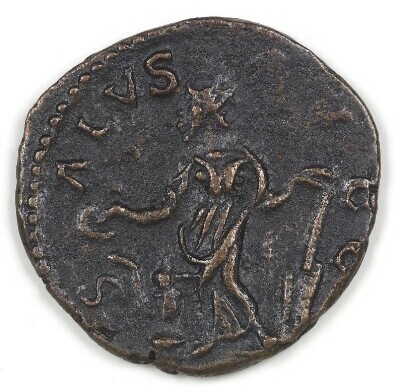 SALVS AVGG(VSTI): Salus standing left, feeding serpent rising from altar out of patera in right hand, holding rudder in left. 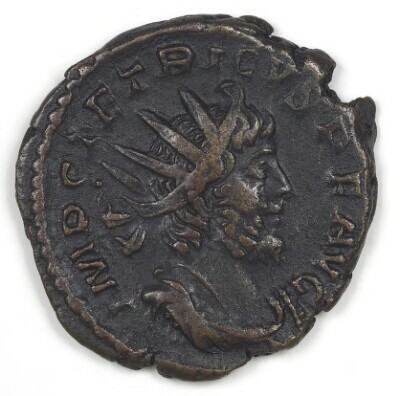 Antoninianus of Tetricus I, 270-273. 1987.46.24. IMP(ERATOR) C(AIVS) TETRICVS P(IVS)F(ELIX) AVG(VSTVS): Radiate head, right; cuirassed, draped. 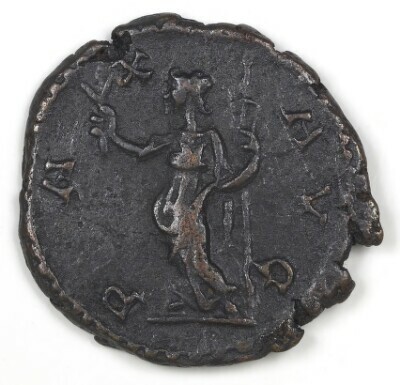 VICTORIA AVG(VSTI): Victory walking left, holding wreath in right hand and palm in left. 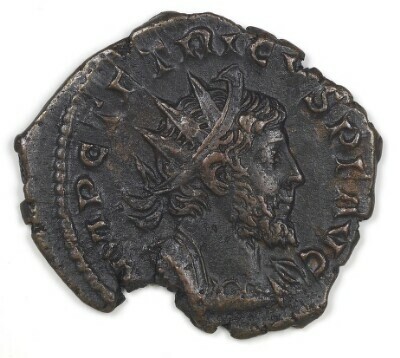 Antoninianus of Tetricus I, 270-273. 1987.46.25. 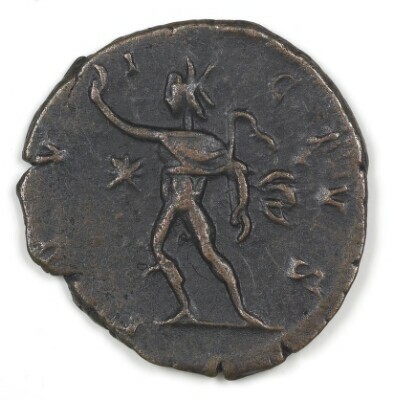 VIRTVS AVGG(VSTI): Soldier standing left, holding spear in left hand, right arm leaning on shield. 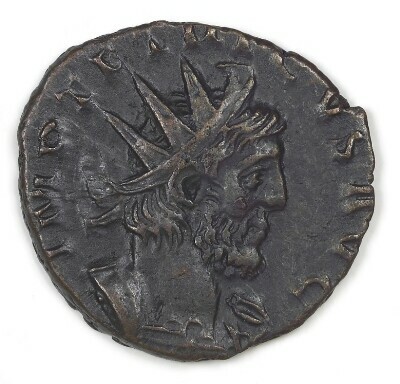 Antoninianus of Tetricus II, 273-274. 1987.46.26. 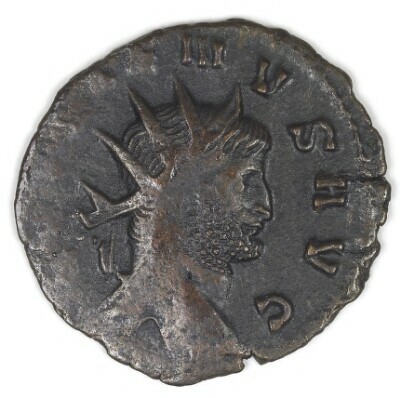 C(AIVS) TETRICVS CAES(AR): Radiate head, right; draped. 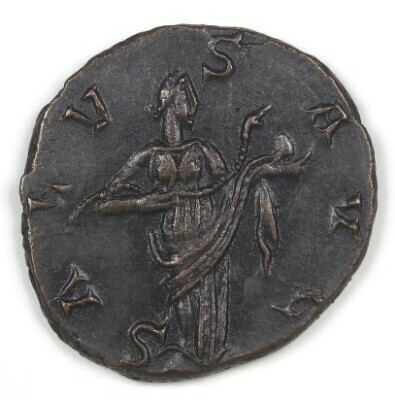 PIETAS AVGG(VSTI): Pontificial implements variously arranged.